Thanks to Donna for today's tutorial! You can visit her blog at DJ's Own. Donna is participating in the Saturday Seminar. (There's still time for you to participate as well!) She was kind enough to write a tutorial for us on the cut and fold technique she used for her before and after card. Click on any of the images to see them enlarged. So, you’re interested in making a cut and fold card but don’t know where to start. I’ve found four ways to get started (though there may be others). 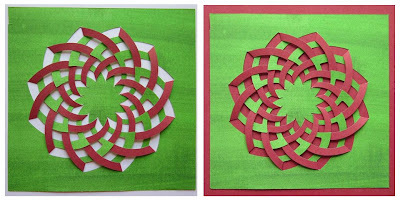 Search the net for “cut and fold patterns” and you’ll find several that you can print out and use to cut your fancy paper using these same techniques. Use purchased metal templates: Lacé, FOLD-em, and American Traditional are some brands I’m familiar with. If you have an electronic cutting device (such as a Cricut) and software (such as Make-The-Cut! or Sure Cuts A Lot), you can download cutting files for free to do the cutting part of the work for you. 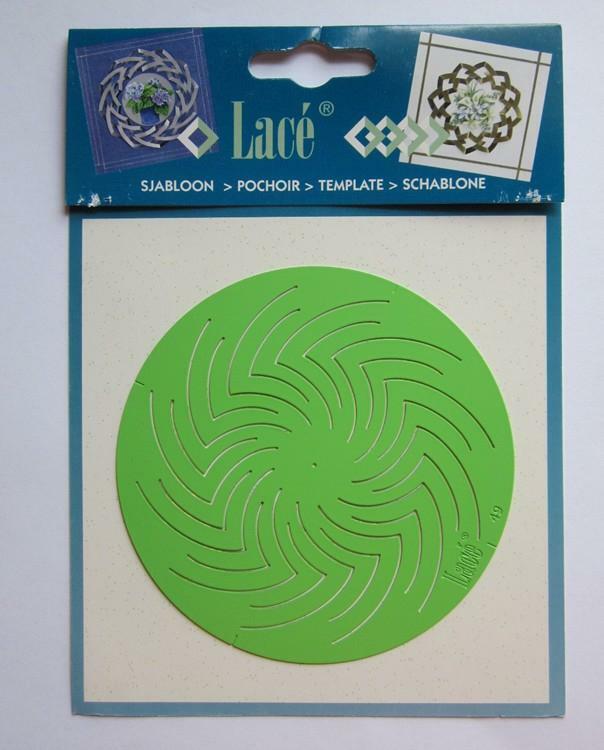 There are also plastic tracing templates which I’ll address at the end. The first and third method can be resized to fit your project. Using metal or plastic templates means you’ll have a final fold in one size only. Select your paper for cutting. 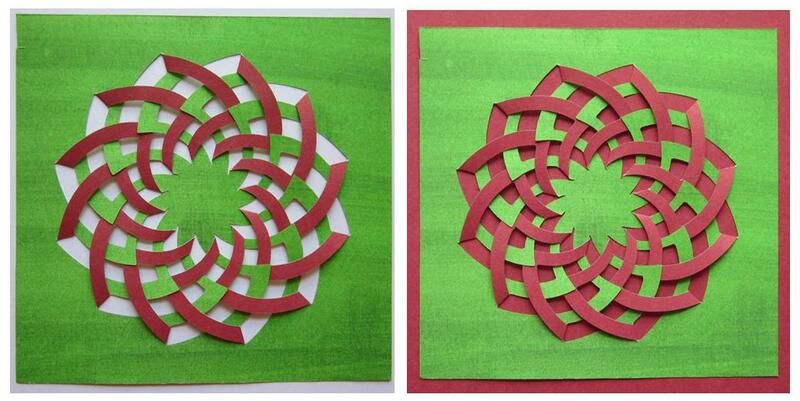 Cardstock can be used, but when folding: thinner is better. I like to use double-sided prints, but white backed papers work well, too. I cut a 4.5” square piece of double-sided paper for this demo. (Not very pretty paper, but easily shows what’s being done.) 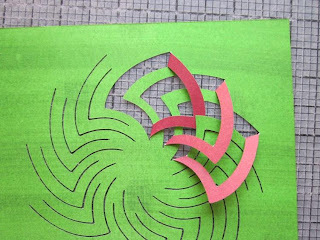 Use non-permanent adhesive to position the template centered onto the front of the paper. You don’t want it to move or your cuts will be out of alignment. With metal templates, use a #16 blade in your craft knife. Make sure you have a sharp tip to get into the corners well. Then begin cutting in all the grooves. You can flip it over to see if the cuts are complete before removing the template. Then, carefully remove the template from the paper and remove any leftover adhesive. If you use an electronic cutting device, the above steps are done for you. Now for the folding part. Lift up one of the points and fold it toward you and down flat. There is no need for glue. Moving in the direction of the points (in this case, counter-clock wise), lift the next point up and fold it back. With this particular template, the third point will easily tuck under the point left by the first fold. Continue around the cuts until all are folded and tucked. Then tuck the last two under their respective points and you’re finished. 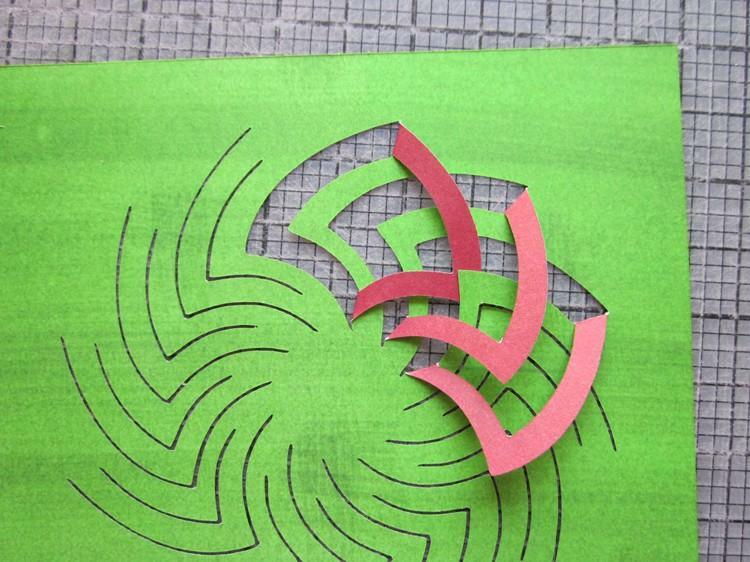 The finished look will change depending on the paper placed behind your folded piece. Here you can see the same piece on a white background and on a red background. Another approach is to cut different cutting groups for a whole different look. With the same template, I made every other pair of cuts. This is the result. Here’s an actual card I made using this template. The finished card is 5” square. There are lots of different templates out there to choose from. This is another metal one that I have from American Traditional along with a card made using it on white-backed patterned paper. I used dark green paper behind the “cut & fold” piece. This card is A2 size and just might find its way to OWH. It employs all the same principles: cut everything first, then fold and tuck. Embellish as desired. The fourth type of template I mentioned in the beginning is a plastic tracing template. I have several from Hot Off the Press. With these, you use a pencil to trace the cutting lines. Then use your standard craft knife to cut the lines. After folding, some of the parts become visible. So be sure to use a good eraser to remove your pencil lines after they are cut, being very careful not to wrinkle your project. Once the cutting is done, you fold as described above. Some of these types of folds may require adhesive to hold in place. Thanks again to Donna for this great tutorial! Remember, if you have a technique to share with us, please email me at kate@operationwritehome.org. These are beautiful. Thanks for using the high contrast papers for the tutorial. Oh Ahhh.....beautiful.....I have a pattern close to this using my Scal...I will try and do this! Thanks for sharing the information. 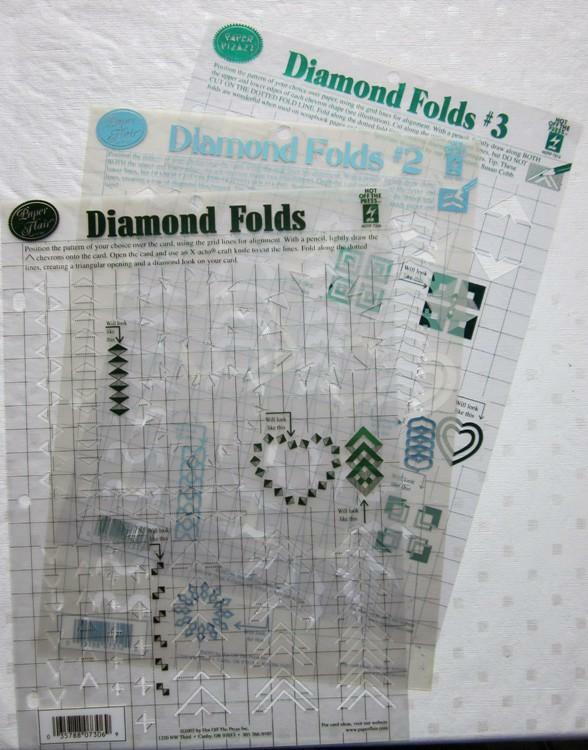 I have one of the Diamond Fold templates, but I don't think I've ever used it. I might have to pull it out. I have several of these templates, but am totally craft knife challenged and could never cut them. Now, they make Geo-Dies that do this for us. Great tutorial! I had seen these templates in catalogs but always thought they looked way too complex. Now that I have seen this tutorial I may have to give one a try because the results are just so beautiful! Very clear directions! Thanks for using the high contrast paper, it makes it much easier to see what's going on. Great job, Donna!! AAAAHHHHH!!!! So that's how you did that!! When I saw it previously on your blog I was wondering about that!!! I'm definitely going to be on the lookout for that template now!! I got the Sunflower one, and it is awesome !! and too easy-- even for me !! Thanx so much for your blogs ! I've learned so much !!! Oh, thanks for the tutorial. I have a metal pattern for a cut and fold I haven't used in years. This inspires me to get it out and dust it off! 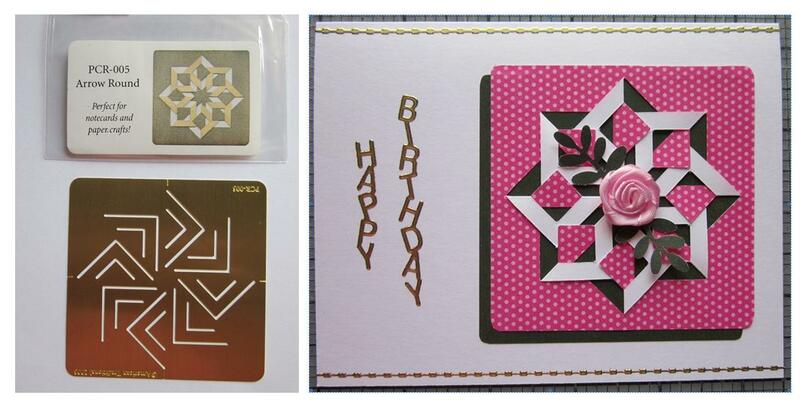 Great cards and easy to see with the contrasting papers. Thanks Donna! Thanks for the info on the Geo-Dies. They do look fabulous, if a little pricey. And thanks for all your great comments. Thanks very much for the wonderful tutorial. How do we post if we don't have blog? Great tutorial! Beautiful cards too! I want to give this a try! where cAN I find the files to cut these types of cutouts on the cricut ??? 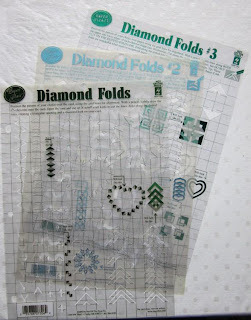 Check out Penny Duncan Creations she has some wonderful files that are free and downloadable for most cutters (Silhouette SD/Craft Robo, Cricut, etc) she also has PDF files for traditional print and cut yourself. http://PennyDuncanCreations.blogspot.com She does very nice work also. 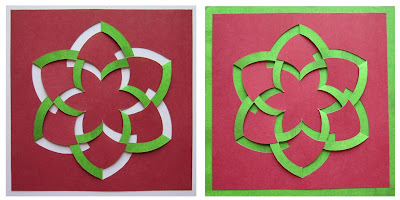 These are great ideas to adopt,its very interesting and creative for cards.